Samsung: No OLED TVs in 2015 | What Hi-Fi? South Korean tech giant Samsung has no plans to release any OLED TVs in 2015, focusing instead on 4K Ultra HD LCD panels and quantum dot displays until it can come up with a means of mass producing OLED panels more affordably. Kim Hyun-seok, head of Samsung Electronics' TV business, said the company's "strategy on OLED TV this year, as well as next year, remains unchanged". This translates to there being no new TVs in 2015. Instead, it has chosen to focus its efforts on 4K TVs. 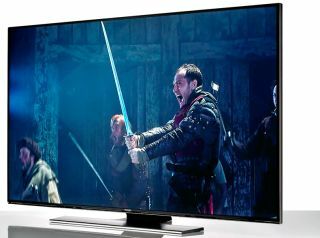 The manufacturer has produced just one set featuring OLED technology, the now-discontinued KE55S9C from its 2013 line-up. Samsung's efforts when it comes to 4K TVs have already achieved some successful results, with What Hi-Fi? Awards bestowed upon the 55in UE55HU7500 and 65in UE65HU7500 models at this year's ceremony, while a 48in variant has also secured the full five stars from our review team too. Samsung Display has said it will continue to produce OLED panels for smartphones and tablets, however. But for the technology to become a viable option for Samsung TVs, the company is waiting to finish developing a 'printing' method to make mass production easier and cheaper. It's also reported that Samsung will unveil quantum dot TVs at CES 2015 in January. No details have been given yet, but Korean rival LG has confirmed it will be investing in the technology - making it feasible that Samsung will be wanting to get in on the action as well. For now then, it seems LG will be the sole manufacturer to still produce OLED for the time being. There are currently three models available in the UK, the 55EC930V, and 4K UHD 65EC970V and 77EC980V. LG spokesman San Kim said, "We will put everything into OLED as we are confident that it will replace LCD as the TV standard in the coming years."